Voters leaving the poll in Williamsport, Pa., were given handouts with instructions on what types of ID they can present when voting in upcoming elections. Photo by Chris Palmer. WILLIAMSPORT, Pa. – Most voters leaving the Annunciation Parish Center in downtown Williamsport today walked out of the building carrying a bright orange sheet of paper, littered with rules, requirements and stipulations. 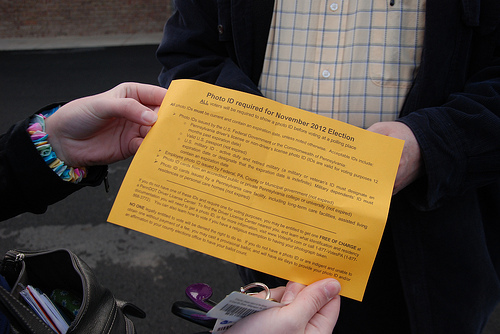 The sheets, which were handed out by poll workers, were part of an effort to educate voters on a recent shift in state voting law: starting in November’s presidential election, anyone who wants to vote in Pennsylvania must present an approved type of photo identification – such as a driver’s license or passport – before casting a ballot. The law, which was enacted on March 14, makes Pennsylvania one of only five states in the country to enact such strict legislation on photo IDs at polling places, according to the National Conference of State Legislatures. Most other states have looser requirements for voter identification, and almost half have no voter identification law. Outside the polls on Tuesday, many Williamsport residents seemed indifferent to the new requirements, saying that it is not uncommon to be asked for ID in a variety of situations. In national political circles, however, the voter identification debate has been filled with controversy. While five states have successfully enacted photo ID laws since 2008, three others have had similar proposals rejected recently: Texas, South Carolina and Wisconsin. And in Wisconsin, where a photo ID bill was actually enacted in mid-2011, two state judges struck the legislation down in March 2012. The second judge to rule on the case said that the law violated the state’s constitution, writing in his decision that no law should undermine a citizen’s right to vote. In all of the states where legislation was proposed and/or enacted – and in Rhode Island and Alabama, where there are plans to implement stricter photo ID requirements by 2014 – the push for the new law was driven primarily by Republican lawmakers, who said it would help lower the potential for voter fraud. But that explanation hasn’t sat well with many Democrats, including John Mussare, a Williamsport resident and chair of the Lycoming County Democratic Party. 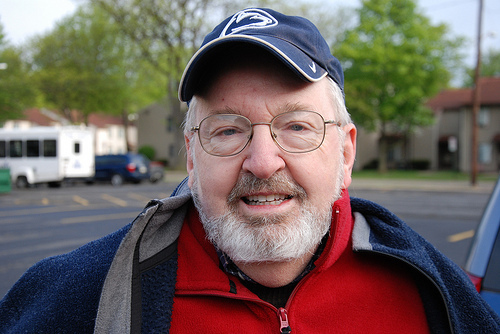 In a phone interview, Mussare said that he thought the Pennsylvania legislation – which was signed into law by Republican governor Tom Corbett and supported by a majority Republican legislature – was “nothing more than a thinly veiled attempt to suppress voters,” and that he is strongly against limiting anyone’s ability to vote. Nicholas Grimes, a 20-year-old student at Lycoming College and an elected member of the Lycoming County Republican Committee, disagreed. He said that Democrats and other opponents of the law were blowing the issue out of proportion. Charles Greevy, 67, from Williamsport, said that "there's going to be a lot to figure out" in regards to Pennsylvania's new voter identification law. Photo by Chris Palmer. Despite all of the hoopla surrounding the issue, few voters who visited the polls on a chilly April morning seemed terribly concerned.